KM: Tell me about the new building in Weissach Flacht. How has that increased productivity and what exactly is going on these days ? HK: In Flacht we have reconstructed all the buildings inside of the original workshop building, so we have a new warehouse with office space included for all our workers. They are highly involved in service for the Super Cup and Carrera Cup. We have a second building where we store our trucks and special equipment for testing different projects. In the building that was previously used as the warehouse we now have our assembly for the GT3RSR and also the RS Spyder. We also have an entire new office building with offices for up to 120 engineers and all the organizational staff. KM: In the past a number of engineers were located up in the towers at Weissach. Have you been able to centralize by moving some of those engineers down to the new facility in Flacht? HK: Yes, we never had an opportunity to run that may projects until now. A lot of them weren�t even in Weissach but somewhere else. So bringing everybody much closer together, specifically that close to the workshop, that really has helped. The logistics coming from the workshops and the parts, are much more efficient. Everybody working on a project can cooperate and work together. It is so much better with so many so much closer. Compared to in the past, that already has made a big difference. KM: So instead of having to get on the telephone to call somebody you can just walk down the hall and see them now. HK: Yes, and it�s also much easier if you have something that doesn�t work properly within two minutes everyone�s there to look at it. Rather than having to set up a time to look at it and have someone come in the next day it gets done much faster. KM: With regards to having four RS Spyders, with possibly a fifth one, for the ALMS, do you have enough cars for the 2007 season, or are you hoping that one or two other teams step up later on in the season as a prep for the 2008 season? HK: There is an opportunity for a sixth car late in the season that might run during one of the final races, but I would say the five cars from Porsche for the beginning is quite sufficient for the ALMS with twice as many cars as last year. On the other hand, we have significantly more cars to support. Just yesterday had the test with the second car for Dyson out at Willow Springs and it worked without any problems. I think that�s a much better way, to grow with a controlled speed instead of trying to push and get everybody out there and race, and at the end of the day nobody would really be happy. So I think that�s absolutely OK and we�re happy with the situation at the moment. KM: So in many ways this is a return to the 956-962 procedure where the factory ran a series of werks cars basically for a test year before turning them over to customers. HK: Very close to that. One thing that we should not forget is that today�s cars and much more complex then they were 20 years ago. I would compare a GT3 RSR today to a 911 GT1 of the 90s. I think that�s something we need to keep in mind and also sometimes slow down the enthusiasm of people to get things realistically set up before offering a new car. KM: You raise a good point, because you can�t necessarily stop progress and this has always been a contention between Grand Am�s philosophy versus the ALMS, where in reality there is no such thing as cost effective racing, there is no cheap entry. While, a GT3 Cup car is an extremely good bargain, do you think that in some way we�ve gone too far with the sophistication and the complexity of a race car? Because, if today�s GT3 RSR is as complex as what a GT1 was, is that something that is really needed? HK: I would not say, in the way you might think about it at the moment. Modern cars that you can see on public roads are much more complex compared to cars 20 years ago. The main content of the car then was mechanical. Today, there are much more electronics involved. If you want to keep racing in that kind of way, going after speed using modern car technology, you don�t have the development time like you do for street cars. So part of that is getting on the race track and getting to know everything and getting to understand all the various systems. With that, it would provide opportunities that we would definitely have to keep under control. On one hand, that is what the Grand Am is trying to do. On the other hand, I think this is car racing as opposed to more then just plain entertainment. We have to keep trying to keep up with what�s going on with development with new technologies. While we are focusing on these various levels of the motorsport activities that we support, if you look at GT3 Cup car, this is still a car that is easy to handle if you understand a little bit about cars. And that�s why we follow this one philosophy with this one makeup where you�re not allowed to modify the car from how it was delivered. So you have to learn to deal with the given level of technology and I think that is the basics that everybody has to get used to before accessing higher levels such as an RSR. Then there is more freedom to change parts, to modify components. And yet, we have to make sure that it doesn�t become an unlimited thing because that would endanger all kinds of theories. We don�t want to get as far as what Formula 1 has become. KM: Interesting response. Back to the complexity of the cars though, from watching the performance of the Porsche powered Grand Am prototypes, it still seems that the cars are somewhat at a disadvantage against the rest of the DP's. Continuing on down to the GT class, you are running against by all accounts, a pure race car that utilizes a tube frame. It is feasible to see somebody converting a GT3 Cup car by tuning it down and actually almost being able to put it on the street. No such category exists for the Pontiac which seems to have a clear advantage as a true race car. Is this just something political that you just have to feel you have to live with in the rules and do the best you can ? HK: We have always placed this point clear to the Grand Am that we are definitely not in favor of putting these cars in the GT category because we have always said that GT class have to be close to production cars. I personally don�t believe that there was always the argument. There is something like a course advantage if you do it with the tube frame cars. I personally believe that if someone was to build his own race car, he should do that, but it shouldn�t necessarily have to look like a Pontiac. If a manufacturer is developing a car like that, why can�t they use a standard production chassis ? We also believe that if you can do something properly, why shouldn�t it be possible to get this car to the same performance as a 911? The 911 by it�s context has some advantages that other cars don�t have. This is the point that we have openly discussed between Grand Am and they know our point of view and we have to respect the manufacturers decision. We definitely wouldn�t like to see if people would design a few frames and put a 911 body over it. KM: In that sense, Porsche is still the only company that offers a race car where the tub itself comes directly from the production line. There isn�t much that comes from the production line at GM on the Pontiac. HK: I personally think, at the end of the day, besides talking too much about it, as long as it�s fair in competition there�s no reason from our side to rethink our situation in the Grand Am. But from my point of view, the concept in the GT racing should always be a modified street car. KM: I suppose that it will come down to how good Tony Dowe is with Porsche's help at outsmarting the rest of the GT competition and the Pontiacs. HK: ( laughing ) I look forward to the challenge. That�s why we like our job. 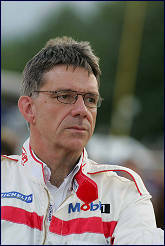 KM: With Alex Job concentrating on Grand Am this year in the DP category, don�t you feel that his presence will be missed after so many years in the ALMS and racing the RSR ? Conversely, Tafel Racing is competing in both series. 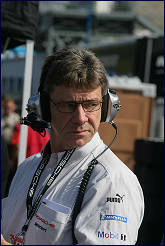 If Tony Dowe can pull it off, perhaps Job should have continued in both series or at least in selected ALMS races? HK: This is something we discussed with Alex last year. He still wanted to run in both series this year. After that we would have to look at his options in the organization and do something that he would want to do. Both series if possible. We have to see if it will finally work and how they will set their priorities. But, yes for sure. It�s always, to a certain degree, a shame to see somebody that was doing a series for many, many years is now doing something else. On the other hand, we work quite hard on getting new teams into the American Le Mans Series. 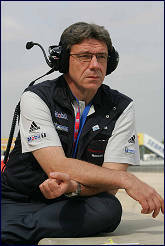 KM: Andrew Cotton recently interviewed Dr. Ulrich of Audi Motorsport, and Ulrich made it absolutely clear that he has final say as to participate in the ALMS or withdraw. He does not have to go back to the board. His complaints have been well circulated in print and on the net. Now that there are approximately 11 cars running in the LMP2 class, it�s pretty much left LMP1 almost a hollow shell. There has been some discussion of scrapping both classes and just running one LMP group with equivalency formulas. Do you have any thoughts on that? HK: I cannot comment on any potential decisions that Audi might make. Maybe I will in the future. But with the concentration on the United States in the American Le Mans Series ? The question would then be can we divide the series in the future? We don�t know if we�ll have the same situation with LMP1 and LMP2 in the future like with GT1 and GT2. From what I know we have only the two Corvettes. If you think about the spectators that are not that much into all these class details. They see prototype cars in P2 prototype Porsches and the Acuras. They would see the two Audis, running their own race in P1 and there�s a huge group of prototypes that really compete against each other and really provide the show. And in GT racing it�s really the same with the two Corvettes with their kind of own race and kind of like between the LMP1 cars and the GT2 cars and other GT2 cars mainly Porsches, Ferraris, Panoz and whatever. This is something vital to spectators. So from that point of view, yes, there has to be a decision I think somewhere how to generate a better mix. Or at least how to consolidate the four categories from four classes into two categories. KM: You�ve been with the company for how many years? KM: You realize with this being the new era, and with the exception of the Footwork F1 project, the LMP2 powerplant is really Porsche�s first successful, normally aspirated race engine since 1974. Do you think there is a turbo version of this engine in the future ? KM: See you at Sebring then. HK: Yes, I will see you there. We are looking forward to the race.